Daniel Carcillo had two points in 26 games and had appeared only once in the last eight games. The Kings’ trade with the New York Rangers was not exactly big news. Kings left wing Daniel Carcillo, who had been used sparingly the last few weeks, was sent to the Rangers for a seventh-round choice in this year’s draft. What is more important is that the move gives the slumping Kings more roster flexibility. It helps create a spot for one of the youngsters in the minors — left wing Tanner Pearson or center Linden Vey — and one of them could be recalled as early as Sunday from the Kings’ American Hockey League affiliate in Manchester, N.H.
"Danny needs to play so it’s a good fit for them," said Kings General Manager Dean Lombardi on Saturday afternoon. Carcillo had two points in 26 games and had appeared only once in the last eight games. He was at Saturday’s morning skate, getting in additional work with the extra players. 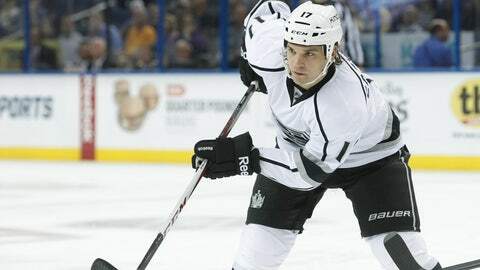 The Kings acquired him from Chicago in July for a conditional draft pick. Additionally, the trade means the Kings don’t have to send rookie goalie Martin Jones back to Manchester immediately. They can keep three goalies on the roster, enabling them to see how starting goalie Jonathan Quick is faring. Quick has been out of game action since suffering a strained groin at Buffalo on Nov. 12. The Rangers moved quickly to make the deal happen after right wing Derek Dorsett suffered a broken fibula Friday against the Pittsburgh Penguins. "We pick up a player that can bring an element of toughness, with us losing Dorsett yesterday for four to six weeks," Rangers Coach Alain Vigneault told the Canadian Press. "It’s an area that we felt that we needed to get a little bit better. Dan became available and we picked him up. "For us it’s a low-risk move. He’s in the last year of his contract, not very expensive, and hopefully he’ll come in and help us."